Do you dream about Christmas parties? Ok, I can’t be the only one! Surely some of you do too. And I don’t mean just any old Christmas party. I’m envisioning one of those idyllic parties you’d see in a movie. Maybe the setting is White Christmas (one of my favorites!) with a mix of The Holiday, Bing Crosby and Ella Fitzgerald playing in the background, partygoers dressed in their best and ready for a festive time. Everyone is mingling around, some with a plate of food and others with a drink in hand. Is eggnog pushing this Christmas dream too far? Not when it’s paired with my version of a croque monsieur! I’ve always dreamed of a party like this. And if you know me, you’ll know that’s no surprise. I’ve always wondered why parties weren’t like the ones of my dreams. Then I finally realized: I just need to throw one! The hardest part of any party is just deciding to throw one. Everyone’s busy during the holidays, and I find it quite easy to talk myself out of going to all the work. There are so many things to consider: theme, menu, time and date… But this year, there are no excuses! Instead of making an entire meal, I love to serve unique “bites” that guests can enjoy throughout the party. The main bite this year is my take on the quintessential croque monsieur. While traditionally made with Black Forest ham, cheese and a light white sauce, I pretty much did none of that. 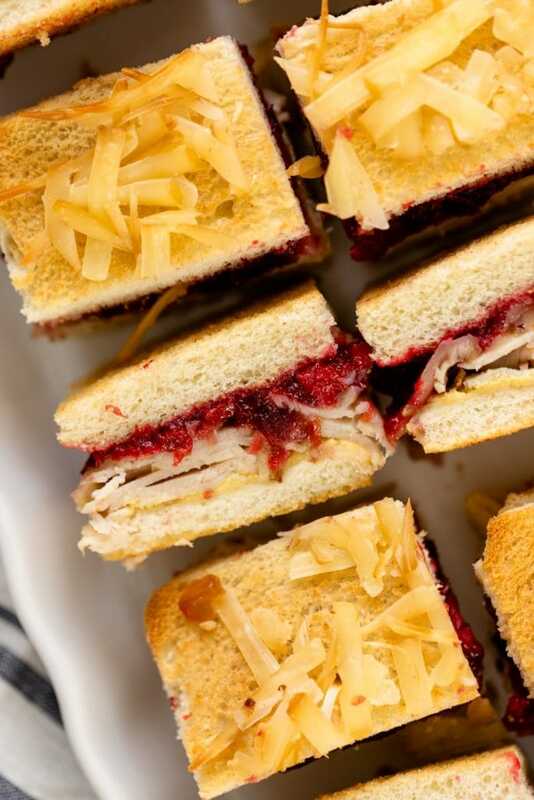 My version layers sliced turkey, smoked Gouda with a quick homemade cranberry jam. The flavors are sweet, savory, salty and perfectly balanced. 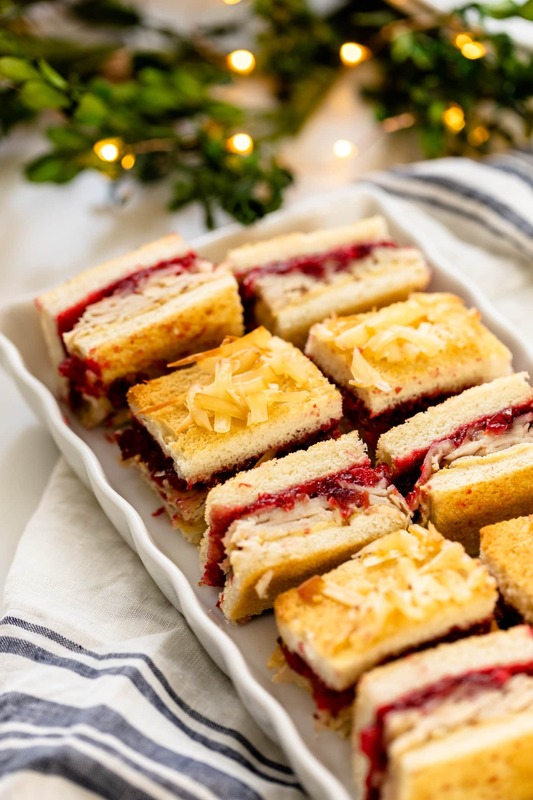 With these handheld-sized sandwiches, guests are free to take one or two (along with some other bites), mingle, then munch some more. As the host, smaller foods also make the work easier for me. As a rule, I pick items that can be partially prepped ahead of time. It just cuts down on my stress level the day of the party and it frees me up to enjoy the party as well. Additionally, most of my favorite appetizers are made in larger quantities, then cut down into smaller portions. This also helps to cut down my prep time considerably! Each layer in this croque monsieur has a different flavor profile, but the combination is perfection! 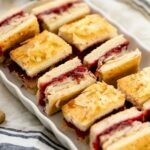 Complete with a homemade cranberry sauce, these turkey croque monsieur sandwiches are the perfect appetizer! When served at a Christmas party, everyone will love them! Slice the orange as thinly as possible. Then dice into smaller pieces. Combine all the ingredients in a small kettle and bring to a boil. Once boiling, lower the heat to a simmer and continue to cook until the cranberries have burst and are thick, about 10-12 minutes. Lay out slices of bread on a baking sheet and toast in the oven until lightly browned and crisp, 3-5 minutes per side. Remove from oven. Spread half the slices of bread with mustard. 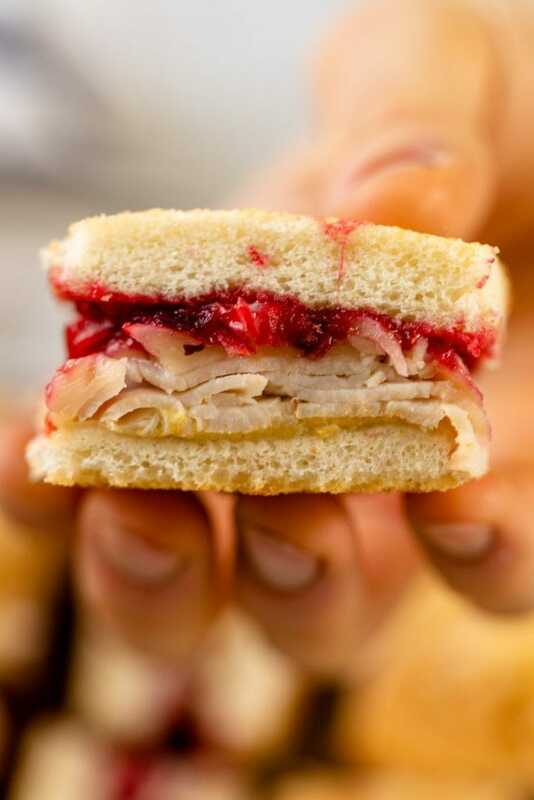 Layer on sliced turkey and shredded Gouda. Return to oven just to melt the cheese, 2 minutes. 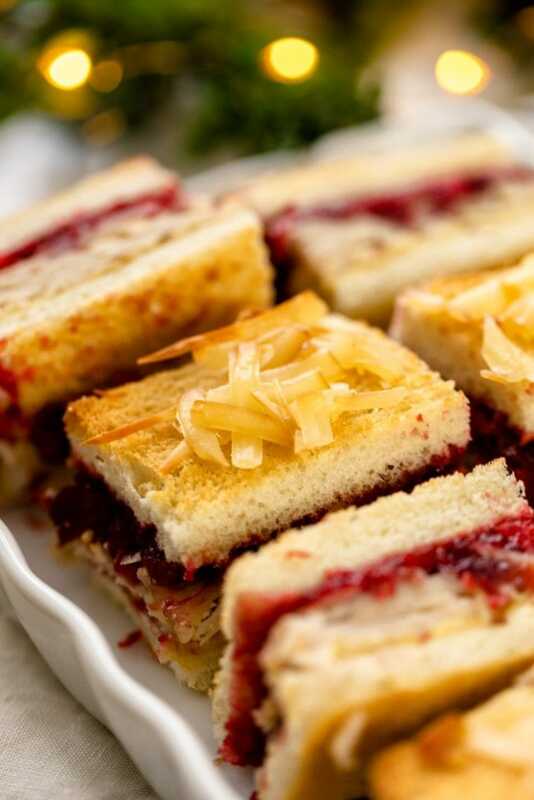 Spread the remaining slices of bread with cranberry jam and place on top of the prepared sandwiches. Sprinkle shredded cheese on the sandwiches and return to oven until melted, 3 minutes. Allow to cool 5 minutes. For a clean, appetizer-style look, slice off the crusts and cut into 4 pieces. These can also be served as whole sandwiches. I made these sandwiches yesterday. They were great. I always look forward to your Tuesday posts.